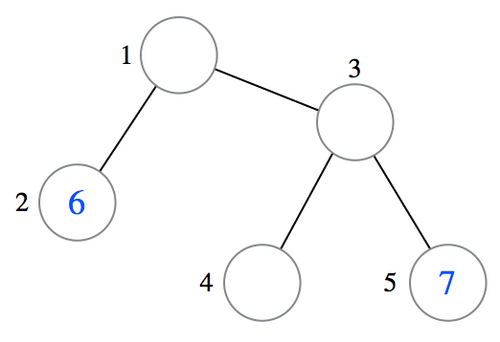 We have a tree with N vertices. 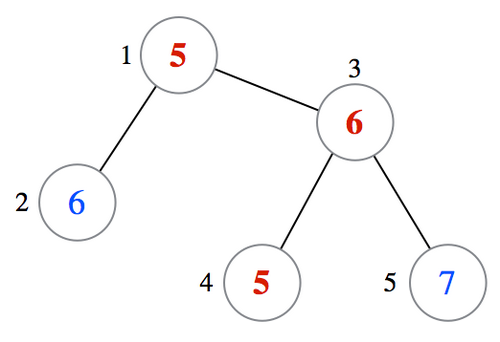 The vertices are numbered 1, 2, ..., N. The i-th (1 ≦ i ≦ N - 1) edge connects the two vertices Ai and Bi. Takahashi wrote integers into K of the vertices. Specifically, for each 1 ≦ j ≦ K, he wrote the integer Pj into vertex Vj. The remaining vertices are left empty. After that, he got tired and fell asleep. Condition: For any two vertices directly connected by an edge, the integers written into these vertices differ by exactly 1. Determine if it is possible to write integers into all empty vertices so that the condition is satisfied. If the answer is positive, find one specific way to satisfy the condition. If it is possible to write integers into all empty vertices so that the condition is satisfied, print Yes. Otherwise, print No. If it is possible to satisfy the condition, print N lines in addition. The v-th (1 ≦ v ≦ N) of these N lines should contain the integer that should be written into vertex v. If there are multiple ways to satisfy the condition, any of those is accepted. The figure below shows the tree when Takahashi fell asleep. For each vertex, the integer written beside it represents the index of the vertex, and the integer written into the vertex is the integer written by Takahashi. The integers written by Aoki may be negative or exceed 106.